The concept of ‘career-long professional learning’ as a means of building teacher expertise and sustaining high level practice brings together several aspects discussed earlier. Two policy interventions used widely in efforts to improve teacher quality are examined: firstly, professional standards which codify professional learning and provide a means for teachers to plan and reflect on their professional learning and to be held account for this and secondly, recertification where teachers at regular intervals are required to renew their professional credentials. 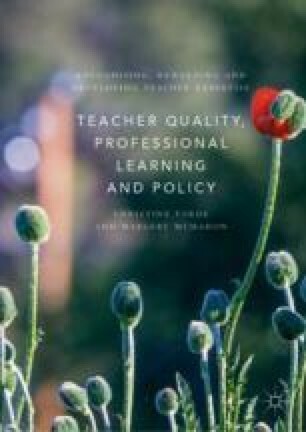 The chapter ends with a discussion of teacher leadership and collaborative professionalism as ways of sustaining and enhancing professional practice. Asia Society. (2015). Implementing Highly Effective Teacher Policy and Practice: The 2015 International Summit on the Teaching Profession. New York: Asia Society. https://asiasociety.org/files/2015-istp-report.pdf. Cordingley, P., Higgins, S., Greany, T., Buckler, N., Coles-Jordan, D., & Crisp, B. et al. (2015). Developing Great Teaching: Lessons from International Reviews into Effective Professional Development. Project Report. London: Teacher Development Trust. http://dro.dur.ac.uk/15834/1/15834.pdf. Darling-Hammond, L., & Berry, B. (1988). The Evolution of Teacher Policy. Santa Monica, CA: The RAND Corporation. https://files.eric.ed.gov/fulltext/ED298599.pdf. Grossman, T., & Hirsch, E. (2009). State Policies to Improve Teacher Professional Development: Issue Brief. Washington: NGA Center for Best Practices. https://files.eric.ed.gov/fulltext/ED507644.pdf. Kelly, F. (2016). Developing Teacher Leadership: Outcomes and Implications from the Scottish College of Educational Leadership’s Teacher Leadership Engagement. Glasgow: SCEL. https://www.scelscotland.org.uk/wp-content/uploads/2016/05/SCEL-Developing-Teacher-Leadership.pdf. Learning Forward. (2011). Standards for Professional Learning. USA: Learning Forward. https://learningforward.org/docs/default-source/pdf/facilitatorguide.pdf?sfvrsn=4. OECD. (2018a). Developing Schools as Learning Organisations in Wales. Paris: OECD. https://doi.org/10.1787/9789264307193-en. OECD. (2018b). Valuing Our Teachers and Raising Their Status: How Communities Can Help: International Summit on the Teaching Profession. Paris: OECD. https://doi.org/10.1787/9789264292697-en. Paliokas, K. (2013). Tiered Licensure: Connecting Educator Effectiveness Policies. USA: Centre on Great Teachers and Leaders, American Institutes for Research. https://files.eric.ed.gov/fulltext/ED555674.pdf. Scottish Government. (2018). Teaching in a Diverse Scotland: Increasing and Retaining Minority Ethnic Teachers in Scotland’s Schools. Edinburgh: Scottish Government. https://www.gov.scot/publications/teaching-diverse-scotland-increasing-retaining-minority-ethnic-teachers-scotlands-schools/. Welsh Government. (2017). Standards for Teaching and Leadership. Wales: Welsh Government. http://learning.gov.wales/docs/learningwales/publications/170901-professional-standards-for-teaching-and-leadership-en.pdf.